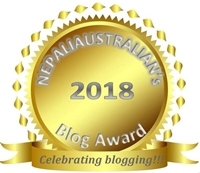 This entry was posted in Nepal, Published, Social Issue and tagged +977, +977 magazine, +977 Nepalese Australian magazine, black outs, load shedding in Nepal, plus977. Bookmark the permalink. 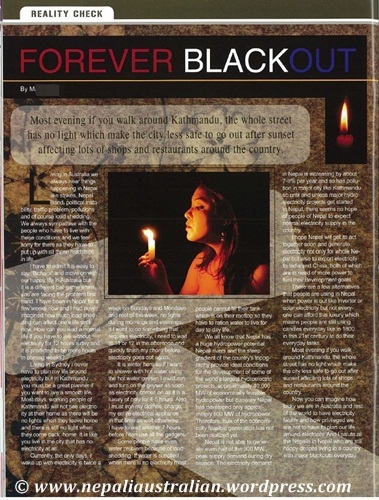 We take much for granted…the question is…will the developed world head towards more blackouts…is our comfort temporary? I really hope not as it will be really scary to live with that situation everyday. we have learnt to witness it every passing hours. and hey, i just got managed to fill some (read many) tanks as there was no electricity today morning / 🙂 it’s been a part of our lives now. Shame on those authorities !! I am so sorry to see this situation of the country due to stupidity of politicians. I wish things will change for better soon. Interesting. Are there any studies on what it would cost to build the necessary hydro facilities? The initial investment cost of small and medium scale hydropower is about US$ 2,000/kW and above.